Nostalgia is a wonderful thing. For people of a certain age Out Run represents days long past, a wonderful era when arcades reigned supreme and home systems paled in comparison. During this time, many valiant attempts were made to produce a home version of Yu Suzuki's 1986 driving masterpiece. However, the 'Super Scaler' technology that gave Out Run its 3D effect (through clever use of sprite scaling) proved too difficult to replicate for the programmers of yesteryear, hampered by less than capable hardware. Since its début almost 30 years ago, only a handful have ever managed to come close to the original arcade experience, most notably the rather impressive Sega Saturn version back in 1996. 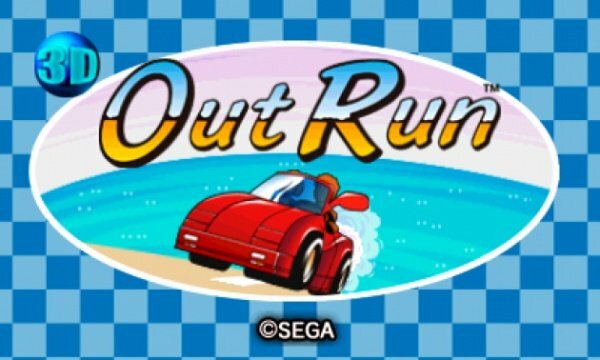 Fast forward to present day and 3D Out Run is finally hitting the eShop in Europe and North America (having been available in Japan since April last year). It really does take Sega ages – but is it worth the wait? The overall premise is simple - race against an ever decreasing time limit through 5 courses, avoiding traffic and roadside obstacles in order to arrive at the finish line. 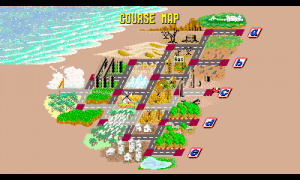 A junction at the end of each course throws up a quick left or right route decision, following which the scenery magically transitions into the next location. Checkpoints provide valuable bonus time and, if successful, one of 5 possible endings will be reached. There's no rival to beat, no race to be won. It's the player versus the open road and that road is gorgeous. Inspired partly by the designer's travels across Europe, expect to cruise past lush greenery and old windmills, iconic Stonehenge-style bridges and palm trees, all against a backdrop of mountain ranges and lush sunsets. It's a joyous mixture of course designs that can be tackled in either their original Japanese running order or the (default) revised western version (which re-arranges certain course positions on the map as well as a few other minor differences). M2 has worked wonders with the Nintendo 3DS hardware to deliver a more-than-perfect version of the original game. For starters, the frame rate is set at a super-smooth 60fps, even with the 3D slider at maximum; this is no mean feat when you consider the original arcade only managed 30fps. In addition the display is now presented in widescreen, taking full advantage of the dimensions available; even purists are catered for with an unlockable 30fps 'arcade' mode along with 4:3 screen options. You can also simulate any of the original arcade cabinet designs, complete with steering wheel and pedal sound effects. The 3D effect works fantastically (especially on a New Nintendo 3DS) and adds a satisfying sense of depth, most noticeably in stages with plenty of background scenery. The other drivers on the road are rather erratic and can switch lanes at a moment's notice, so the enhanced depth perception can make weaving between traffic and understanding when to drop the accelerator or brake much more obvious. For every different end goal reached, a new feature becomes available in the form of a tuning item. These can be toggled on or off via the touchscreen before beginning each game. Pleasingly changing the colour and/or shape of the car, each item affects car handling in one of four ways: better turning, less penalty for hitting traffic, higher top speed and the game-changing ability to drive off road with no speed loss. (For those of you good at mathematics – the 5th and final goal unlocks the 'arcade' 30fps mode mentioned previously) Tuning items can all be switched on or off independently of each other, making for a variety of set-up options. In a well thought out decision, there is even a separate scoreboard whenever tuning options are activated. No review of Out Run would be complete without delving into the simply superb soundtrack, which is integral to the overall experience. It's tough to choose between Passing Breeze, Magical Sound Shower or Splash Wave, each of these tracks being an undisputed classic. Playing with the volume up is not only recommended, it's practically a necessity. Developer M2 went one step further and commissioned two additional new tracks for the 3DS version; 'Cruising Line' and 'Camino a Mi Amor'. Both are nice enough and fit in just fine, but sound a little bit like B-Sides in comparison to the stunning originals. It's clear that nothing can ever replace the sublime experience of sitting inside a hulking, moving arcade cabinet, steering wheel shaking and Passing Breeze pumping out of the speakers. But with arcades becoming increasingly rare, the Nintendo 3DS version steps up to the table and makes up for its diminutive size by packing in plenty of extra features, stunning presentation and immaculate controls. (Note: the Ferrari license still doesn't feature) It may have taken the best part of three decades, but M2 has delivered what is quite simply the best ever home version of Out Run. A fantastic version of a timeless classic and another victory punch for Sega's 3D Classics range - 3D Out Run is a beautiful journey that everybody should take. On my instant-buy list. Has been there for a while already. Awesome review! Can't wait to download this classic tomorrow! I will have to add some eShop funds, but this is totally worth it. Day one purchase for me and I never played the original. Can't wait to add yet another timeless, awesome Sega arcade game to my pocket. Out of all the Sega 3D classics, this was the one I was looking forward to the most. Definitely getting this. Oh man, I've been waiting nearly a year for this, can't wait for the eshop to update! For my generation, this is the quintessential racer. Oh, how I yearn for a Wii U version . . . Friend of mine has an original stand-up Outrun arcade machine and it is still a joy to play that game after so many years. This looks like a better way. And I will see you and Afterburner on my 3DS tomorrow. If only a worldwide, physical release of the 3D Fukkoku Archives compilation (which features this game) was financially realistic! This game, I had no clue what I was supposed to do when I had the MegaDrive's version, it was a nightmare!!! What a great quarter muncher. Really brings me back to the days of working in an arcade as a teenager. Might have to run the headphone jack through the home stereo on "11" to get the full effect of the audio. Great review, got me hyped. "It's tough to choose between Passing Breeze, Magical Sound Shower or Splash Wave"
No it isn't. The answer is ALWAYS Magical Sound Shower. OutRun on my n3DS will join OutRun 2 for my Xbox and OutRun 2006: Coast to Coast for my PS2. I've been waiting for this one, it's Day 1 for me. @Storytime7 Me too. Word for word. Outrun is so iconic. 'Best home version available' = instabuy as my first 3DS eshop purchase. Can't wait. 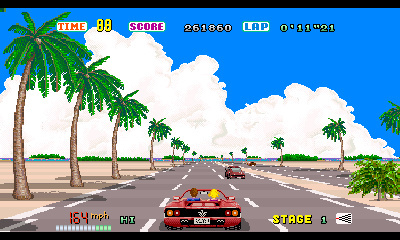 OutRun is one of the best games ever. 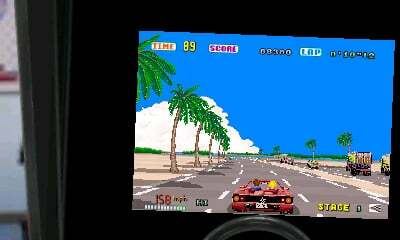 Now if only M2 could bring OutRun 2 to the Wii U with the same care. 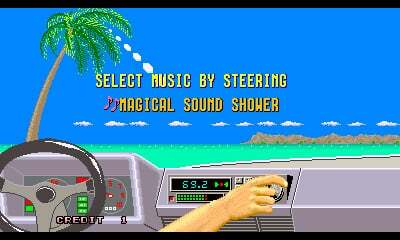 Outrun is one of the best games ever. I have spent countless hours on the original and 2006 version. One of my favorite quarter-munching arcade games when I was a kid. SO HAPPY this is finally available here in North America! Instant buy. Can't wait!!! Been waiting for "tomorrow " since reading about the JPN version months ago! @unrandomsam That does look like it would be a pain to take to the toilet, though. Yes, Finaly this will be out! The moment i wake up, i go see if it has arived in the E-shop! Then fill up my money on the system, as then i will have not enough for Thunderblade! I want ALL the sprite scaler games! 10/10 - Too Much Awesome. I'm glad this game is available now, but.....where is Shining Force 3D? Come on Sega, do it already! Sorry, but I don't like the idea of merely racing against a timer instead of other racers, so I'll pass. It sounds like another excellent job by M2 for those of whom do like the idea, though. I have a Special Stages Out Run 2 Arcade Twin in the basement.. This game is amazing. I'd love to see the sequel redone for 3DS as well, not that it's ever happening. I've been waiting for this game for a while now. I've never played any of SEGA's arcade games, so these are a brand new experience for me! I have GF II and Afterburner II and both are mighty impressive! I LOVE OUTRUN!!! One of my all time favorite games!! I have the master system,Genesis, Saturn, xbox, 360, gba, ps2, and psp versions!! I will add this one tomorrow! I wish it would come to wii u along with a ton of other sega classics!!! Been a little while since I bought anything on the 3DS e shop. I will be getting Out Run. Bring Outrun Coast 2 Coast after this release! SEGA have do it again they just keep getting better and better hope they keep this up. Now Nintendo need to step up to the mark and show us how good they can be. It`s a bit like back in the days of the Megadrive and SNES which one was better last time it was close but this time SEGA are way out in front this time. I didn't know they had added two songs to the game. I wish they had added Shiny World from Outrun 2, it's a fantastic track! unlockable 30fps 'arcade' mode along with 4:3 screen option how do you get this then ? I wanted to buy a couple of the sega 3d classics this morning, but can't find them on the eshop, anyone know where they are hiding ? @deKay Too bloody right it is. @XyVoX you have to reach all 5 endings (A,B,C,D and E) to unlock the option for 'arcade' mode. The screen sizes are in the settings straight away, I find using the 4:3 size together with stand up cabinet (gets rid of the image of the steering wheel at the bottom which annoys me) is most authentic to the original look. Sega should just go back to making these sort of games. Their arcade devision used to produce some of the most playable games ever produced, and some where along the way they've lost that sparkle. No outrun for us in Australia. What could possibly be the problem releasing it here? Today is a great day because of this.. no lie, my MOST anticipated title of 2015 for 3DS and it does not disappoint!!!! I've bought it already. First impression - was the accelerator on the original arcade machine analogue? The on/off button replacement feels wrong but maybe that's because modern driving games have analogue trigger acceleration. In all honesty these Sega remasters from their more popular catalogue and the amount of obvious work that has to go in them all for £4.49 then (as most people are recognizing) the inherent lack of effort that Nintendo is bringing to the VC and its own popular titles at best a virtual straight emulation in many cases for more money that Sega's games and you can yet release once again their lack of understanding in such matters. Simply put.....This game is freaking awesome! Once again Sega single handedly saves 3D Classics. Personally I hope they are making a bundle on these classics and are considering opening the flood gates with some more of their old arcade games. I would love to see Super Monaco Arcade and Shining in the Darkness from Sega Genesis. There are so many more and I would buy them all up like I have so far. Some of these titles are even better than some retail releases. Go Sega! Go Sega! Go Sega! GO! 10 out of 10! If Sega stops doing these 3D Classics we will more than likely never see another 3D Classic game again. Just a damn shame. Should have been 10/10. The only racing game comparable is OutRun 2. I love Sega for doing these games. We need Konami to jump on board and start 3dizing all those Hudson soft titles they bought the rights too. Not to mention Konami has some pretty darn good ones that would be awesome in 3D. Nintendo and Konami WHERE ARE YOU? Does anyone else know the "minor" differences between old and new version of the game besides the layout of the levels? The review mentioned minor differences but didn't say what they were. @dok5555555 the first stage is laid out slightly different in the original japanese version and there's a few little bugs ironed out that you probably wouldn't notice. If you google Sega Blog they have a great interview with the developers which details some of them out. @gingerbeardman @moomootown Thanks for the info. This game has emptied the power of my new 3DS more than 3 times allready! I hope Sega will release all their big arcade hits from yesteryear where they used sprite scaling. Turbo OutRun, OutRunners, Power Drift, Rail Chase, and also the first Hang on would be great. I would get them all! Also i don't understand, i gave a 5 star rating in the Eshop. I only see 3 ratings here (location: Europe Netherlands). I wonder if there are so manny fans here, why the game has just 3 ratings? All you have to do is having played the game for a hour to be able to rate it Show Sega how much you want them to continue making those sprite scaling classics! Essential reading for any Out Run fan!